A couple Colorado Rapids updates for you all this afternoon (or evening depending on where you are). First up from the desk of Steve Goff. He’s reporting that Fernando Clavijo “thought he would be fired” but did not in a recent meeting with executives from the club. Instead he was pretty much given an ugly vote of confidence, meaning he is the lame duck that we all thought he was. His contract expires at the end of the season and unless the Rapids turn things around quickly and make a MLS Cup this season, Clavijo will be shown the door after the final game. I think the club is probably doing this because 1) they rarely make moves like this during a season, 2) they are hoping in the off-season to be able to bring in a John Spencer (former Rapids striker) or a Paul Merinar to take over, and 3) because at this point I think they believe their club is seriously still in the playoff hunt despite their recent form. I guess they don’t watch their club much either. 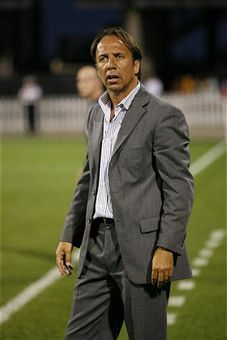 Clavijo isn’t the answer now, nor has he really ever been for this club. I could see him go elsewhere in this league but then again I wonder if any club would really take a chance on a guy that is well below the sea level in terms of all-time records. In other Rapids news, I have gotten word the LA Galaxy have indeed passed on defender Cory Gibbs and that the Rapids will use their allocation spot to sign Gibbs. No word on if they will actually keep him but more than likely they will at this point in the year. Decent move for the club but in all reality they should try to trade him away to a club that needs defense and that would probably be willing ot deal with them for him (Dallas, Chivas, or Columbus). No word on what exactly his contract will be like. My guess for a guy that is an injury concern he will get a deal with some options for a couple of season. That would make the most sense because you don’t want to be tied down to a player that is pretty much on the IR all the time. Could the Galaxy trade Ruiz for the rights to Gibbs? Just an idea, since Colorado needs forward help and LA still needs help on D.